Rio Grande freshman Chyna Chambers had a career-high 16 points in Tuesday night’s 74-64 win over Asbury University in Wilmore, Ky.
WILMORE, Ky. — It doesn’t matter if you’re ranked in the Top 25 and sporting a long winning streak — winning on the road isn’t easy. 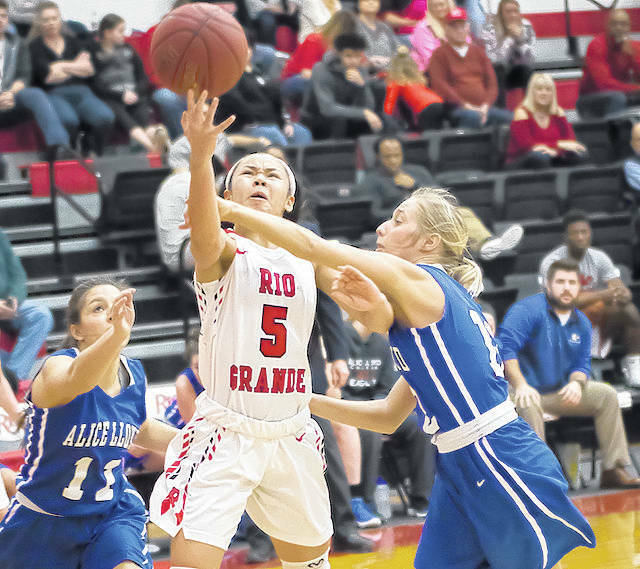 That’s exactly why University of Rio Grande women’s basketball head coach David Smalley had no plans on apologizing for his club’s less-than-picturesque victory on Tuesday night. The RedStorm shot just over 39 percent from the field and battled from the outset to hold off host Asbury University, but survived for a 74-64 win over the Eagles in River States Conference play at the Luce Physical Education Center. Rio Grande, ranked No. 21 in the latest NAIA Division II coaches’ poll, won for the 20th straight time and upped its record to 22-1 overall and 10-0 in conference play. Asbury slipped to 5-16 overall and 2-8 in the RSC with a fifth straight loss. Rio Grande led from start to finish, but saw an 11-point second quarter shaved to just four, 30-26, at the intermission. The Eagles pulled to within three points twice in the third period, but the RedStorm surged ahead by 12 points, 49-37, after a jumper by junior Jaida Carter (New Philadelphia, OH) with 2:14 left in the quarter. Asbury countered with another surge, cutting the deficit to seven at the end of the period and down to just four, 60-56, after a three-pointer by Bethany Koons with 4:54 left in the game. Rio finally settled the issue once and for all with an 11-1 run over the next four minutes, taking its largest lead of the night, 71-57, after a layup by junior Jasmine Smith (Canal Winchester, OH). Senior Alexis Payne (Deep Water, WV) led a quartet of double-digit scorers for the RedStorm with 18 points and also pulled down a team-high eight rebounds. Freshman Chyna Chambers (Columbus, OH), who kept the RedStorm afloat during offensive struggles in the second and third quarters, finished with a career-high 16 points and had a game-high two steals in the winning effort. Smith and Carter tallied 11 and 10 points, respectively, while sophomore Sydney Holden (Wheelersburg, OH) handed out a team-best four assists despite being slowed by foul troubles. Rio Grande finished with a 47-41 edge in rebounding and survived its cold shooting by committing a season-low 10 turnovers. Kelsey Johnson had 17 points and 10 rebounds in a losing cause for Asbury, while Autumn Herriford had 16 points, 11 rebounds and two blocked shots. Bailey Brown added a game-high five assists for the Eagles. Rio Grande returns to action on Thursday night, hosting Indiana University Kokomo in a 5:30 p.m. tip at the Newt Oliver Arena.